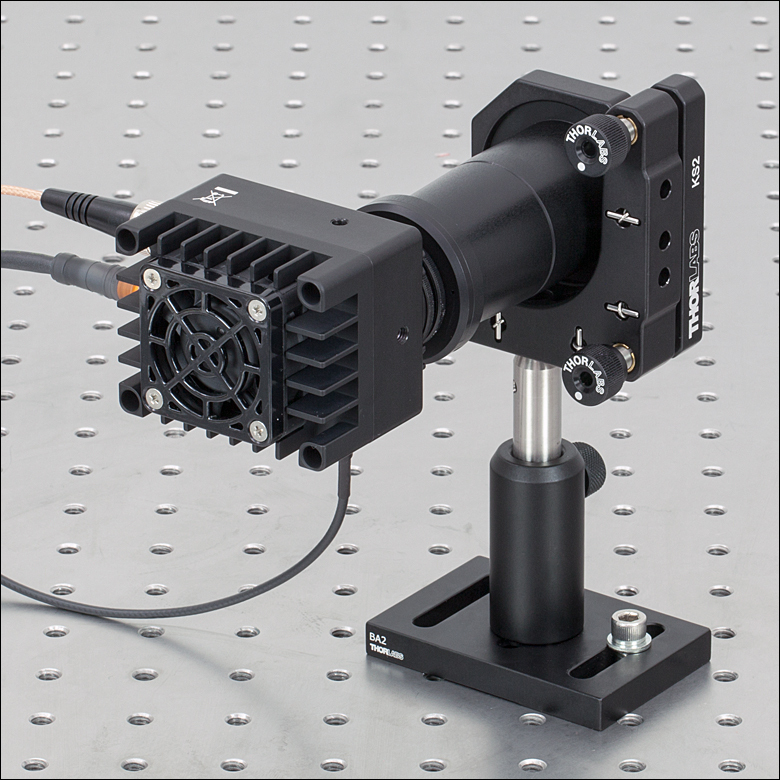 Each Fabry-Perot interferometer features a thermally stable Invar® cavity. Thorlabs' Scanning Fabry-Perot Interferometers are spectrum analyzers that are ideal for examining fine spectral characteristics of CW lasers. Interferometers are available with a Free Spectral Range (FSR) of 1.5 GHz or 10 GHz. The resolution, which varies with the FSR and the finesse, ranges from <1 MHz to 67 MHz. For information on these quantities and their applications in Fabry-Perot interferometry, see the Fabry-Perot Tutorial tab. The confocal Fabry-Perot cavity transmits only very specific frequencies. These transmission frequencies are tuned by adjusting the length of the cavity using piezoelectric transducers, as shown in the diagram to the right. The transmitted light intensity is measured using a photodiode, amplified by the transimpedence amplifier in the SA201 controller (or equivalent amplifier), and then displayed or recorded by an oscilloscope or data acquisition card. Each Fabry-Perot interferometer has a cable ending in a BNC connector for controlling the piezo. The mirrors in the SA200-18C and SA210-18C are made of IR-grade fused silica (Infrasil®), the mirrors in the SA200-30C are made of yttrium aluminum garnet (YAG), and the mirrors on all other models are made of UV fused silica. Each Fabry-Perot interferometer also features an internal housing made of thermally stable invar to eliminate misalignment due to temperature fluctuations. 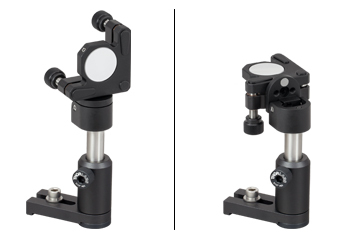 The SA200 and SA210 models feature SM1 (1.035"-40) and SM05 (0.535"-40) threading, respectively, on the back of the instrument for detector mounting. 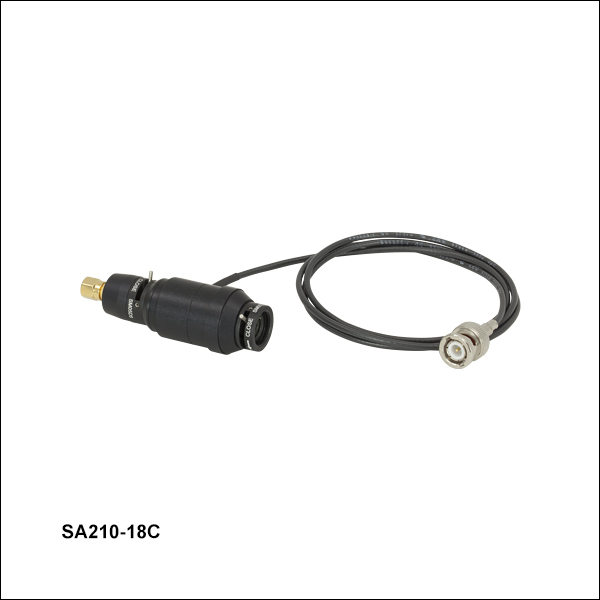 Except for the SA200-30C, each Fabry-Perot scanning interferometer comes with a photodiode detector included, as well as an SMA-to-BNC cable to connect the detector to an amplifier. This photodiode can be removed for alignment purposes or for replacement with another detector. The confocal design of the Fabry-Perot interferometer cavity allows for easy alignment of the input beam. The optical axis of the Fabry-Perot interferometer can be aligned with sufficient accuracy to the input beam by mounting the interferometer on a standard kinematic mirror mount and following the steps on the Alignment Guide tab. An example of our SA200 Fabry-Perot interferometer being mounted in a KS2 kinematic mount is shown to the right. For the SA30-52, which has a finesse of >1500, additional steps are necessary to ensure proper alignment of the interferometer. The system will need to be fine-tuned while observing a transmission mode in order to suppress higher order modes. For more details, see the Alignment Guide tab. The SA201 controller (sold separately) generates a sawtooth or triangle wave voltage required to repetitively scan the length of the Fabry-Perot cavity in order to sweep through one FSR of the interferometer. 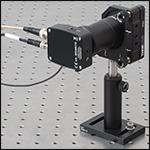 The SA201 controller also houses a transimpedance amplifier that can be used to amplify the output of the photodiode detector in the Fabry-Perot interferometer; this detector measures the intensity of the light transmitted through the confocal Fabry-Perot cavity. The controller also provides a trigger signal to the oscilloscope, which allows the oscilloscope to easily trigger at the beginning or the middle of the scan. 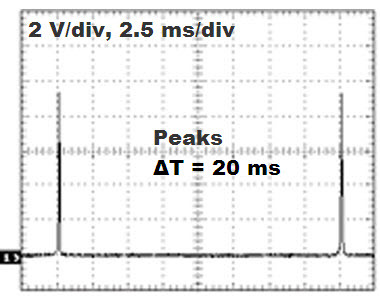 The time axis of the oscilloscope can be precisely calibrated by observing two instances of a given spectral feature separated by one FSR (see the Calibration tab for more details). For more information on connecting the Fabry-Perot to the controller and an oscilloscope, see the Pin Diagrams tab. (200 nm to 4700 nm) are available upon request. If the coatings represented in the graphs below do not suit the needs of your application, please contact Tech Support. The plots below show the reflectance of the mirrors in our Fabry-Perot interferometers. "Mirror Finesse" refers to the contribution to the total finesse value due to the reflectance of the mirrors. In a system with near-perfect alignment, the finesse of the Fabry-Perot cavity will be limited by the reflectance of the mirrors, and the finesse values will approach those shown on the plots below. For more information on finesse, please see the Fabry-Perot Tutorial tab. Please remember that the actual reflectance of the mirror will vary slightly from coating run to coating run within the specified region and can vary significantly from coating run to coating run outside of the specified region. The total cavity finesse depends on additional factors. Please see the Fabry-Perot Tutorial tab for more information. Custom mirror coatings for wavelengths from the UV to the mid-IR (200 nm to 4700 nm) are available upon request. If the coatings represented in the graphs below do not suit the needs of your application, please contact Tech Support. This data has been smoothed in the wavelength region from 2.65 - 2.7 µm due to measurement inaccuracies introduced by absorption by water vapor in the air. For details on operation from 2.6 - 2.8 µm, see the -18C/30C Detectors tab. Our Scanning Fabry-Perot (FP) Interferometers have confocal FP cavities. Since the transverse modes of a confocal cavity are degenerate, the cavity is fairly insensitive to the alignment of the input beam. As seen in the ray trace in Figure 1, even an off-axis input beam that is not parallel to the optical axis of the FP cavity will make one round trip through the cavity with an approximate path length of 4d-h4/d3, where d is the distance between the mirrors and h is the distance that the input beam is from the optical axis when the beam enters the cavity. As long as the second term in the path length expression is much less than the wavelength of the light, then the off-axis input beam will be degenerate with the on-axis input beam. The second term in the path length expression also limits the diameter of the input beam. In practice, the cavity can be aligned by mounting the confocal FP interferometer in a standard kinematic mirror mount (KS2 for SA200 and SA30, KS1 for SA210), which is then placed in a free-space beam after a fold mirror. While the cavity is being scanned, iteratively adjust the position of the mirror and FP interferometer until the cavity is aligned with the input beam. After the cavity is aligned to the beam, a lens should be placed in the beam so that a beam waist with the specified diameter is formed in the center of the cavity, which is marked by a groove in the outer housing of the instrument (See Figures 3 and 4). In addition to the visible (350-700 nm) spectral range broadband dielectric mirror listed here, Thorlabs also sells Broadband Dielectric Mirrors suitable for other spectral ranges. Alternatively, a protected metallic mirror made from silver or aluminum could also be used. In addition to the visible (400-700 nm) plano-convex lens listed here, Thorlabs also sells mounted and unmounted plano-convex lenses suitable for other spectral ranges. Figure 7: Flipper Mirror in the Up Position (left) Intercepts Beam and Directs it to Interferometer Setup. Flipper Mirror in the Down Position (right) Allows Beam to Downstream Optics. Figure 5 above depicts a setup to integrate an SA210 FP Interferometer into a free-space system. Figure 6 shows a similar setup for the SA200. 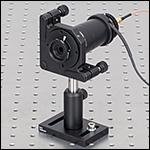 The easiest method for integration is through the use of a flipper mirror and kinematic interferometer mount. The advantage of the flipper mirror is that it allows normal system operation with the ability to measure the source spectrum when necessary, without repositioning optics and equipment. During normal operation, the mirror can simply be flipped out of the way of the beam, allowing the beam unobstructed propagation downstream. When necessary, the mirror can be flipped upright to intercept the beam and pass it down to the interferometer (see Figure 7). The system shown in Figure 5 is a single mirror system; here, the flipper mirror intercepts the beam, which is then directed toward the focusing lens and the interferometer in a kinematic mount. This minimizes space and components required, useful in a compact setup. 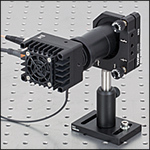 The SA210 FP Interferometer is shown mounted in a KC1(/M) (the KS1 would work equally as well) kinematic mount; the SA200 FP Interferometer is shown mounted in a KC2(/M) (the KS2 would work equally as well) kinematic mount. 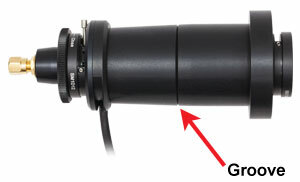 Figures 5 and 6 show a mounted lens threaded into the LMR1(/M) lens mount (an unmounted lens will work just as well). The specific optics (mirror and lens) will depend on the wavelength of the system. Measure the height of the beam from the table surface; in general, it is good practice to start with your optics centered at the height of your beam. Install the flipper mirror assembly (mirror mount with mirror, flip mount, post, and post holder) with the mirror in the up position at a 45° angle to the beam. 90° bounces make the initial alignment and walking the beam for fine-alignment much easier. The tapped holes of the optical table make an excellent guide for the initial setup. With the flipper mirror installed and correctly deflecting the beam by 90°, secure the flipper mirror assembly to the table with a 1/4"-20 (M6) screw. Then mount the interferometer so that the beam enters the center of the aperture; the iris may be used to guide the alignment. While not necessary, if the vertical centerline of interferometer is set at the height of the beam, the initial setup should line up nicely and produce enough of a signal to simply use the kinematic mount of the flipper mirror and the kinematic interferometer mount to guide the beam into its optimal alignment. Turn on the Fabry-Perot controller box, and start scanning the length of the cavity (set the amplitude at >10 V to ensure that more than 1 peak is displayed) since light will only be transmitted when the cavity length is resonant with the wavelength of the light beam. Connect the detector output and the trigger or ramp signal to an oscilloscope. If no signal is detected at this point, it might be necessary to remove the detector from the back of the Fabry-Perot cavity in order to coarsely align the cavity. The iris located in the back of the interferometer can also be used to guide the alignment. However, this may be unnecessary if care is taken in the initial placement of the optics. Use the kinematic mount holding the interferometer and the flipper mirror to walk the beam until the Fabry-Perot cavity is correctly aligned. Insert the lens (according to the table above) in the path at the specified distance so that the beam waist is centered in the Fabry-Perot cavity (marked by a groove on the FP housing, see Figures 3 and 4). Adjust the height and position of the lens to center the beam on the entrance aperture. The mirror and interferometer mount can be used to tweak the signal back into its optimal levels. Compared to the SA200 and SA210 series interferometers, the SA30 series requires several additional steps in order to properly align the system. After following the alignment steps above, zoom in on a single transmission mode and continue tweaking the alignment for maximum suppression of higher order modes; these higher order modes typically occur within a few MHz of the fundamental transmission mode. To do this, it is convenient to set the oscilloscope to one of the larger transmission modes in the spectrum. The lens position may also need to be adjusted slightly in order to achieve proper alignment and suppress the higher order modes. The images below show examples of transmission spectra before and after fine tuning the alignment for higher order mode suppression. Here, the higher order transverse modes are still visible. This setup requires further tweaking to optimize alignment. Here, the higher order modes are suppressed. This setup is properly aligned. This section describes the electrical connections between a Fabry-Perot (FP) interferometer, an SA201 control box, and an oscilloscope. The SA201 provides a voltage ramp to the piezoelectric transducer inside the FP cavity, which controls the cavity length. The oscilloscope is used to view the output from the scanning FP and the controller. This connection is not part of the setup for the SA200-30C. This connection is part of the setup only for the SA200-30C. 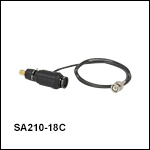 The SMA to BNC cable is included except for the SA200-30C, which does not include a detector. See the -18C/30C Detectors tab for more details. This trigger output signal may be used to externally trigger the oscilloscope. The trigger is capable of driving 50 Ω terminated cables, as well as Hi Z loads such as oscilloscopes. The trigger will provide an edge on the beginning and middle of the scanning ramp. The output BNC is used to drive the SA200 scanning piezos from 1 to 45 V. The output is capable of driving 0.6 μF piezo loads at a ramp rate of 1 ms over the full voltage range. The output current is internally limited to prevent damage to the output drive. This input BNC is used to interface the photodetector, provided with the SA200 scanning heads, to the amplifier circuit. The photodiode amplifier is configured to operate with the Thorlabs supplied photo detectors; however, it is possible to operate user supplied photodetectors. To do so, the BNC center contact must be connected to the photo detector cathode and the BNC shell must be connected to the photodiode anode (unbiased operation). If a biased detector is to be used, the BNC shell must be connected to the bias ground and the bias voltage must be negative for the circuit to operate properly. This BNC is the amplifier output and may be connected directly to an oscilloscope to view the cavity spectrum. The amplifier gain will be set using the front panel 'DETECTOR' control knob. The amplifier output includes a 50 Ω series resistor to minimize noise when operating with a 50 Ω coax cable. For best results, a 50 Ω load resistor is recommended at the oscilloscope. Note, the amplifier gain will be halved with a 50 Ω load connected. For a Fabry-Perot cavity, the finesse is a measure of the interferometer's ability to resolve closely spaced spectral features. The total finesse of an interferometer is defined as the ratio of the Free Spectral Range (FSR) to the Full Width at Half Maximum (FWHM) of the resonant peak, where Δ is the FWHM. The FSR and the FWHM can be in either units of meters or Hz (be sure to use consistent units); an example of the FSR and linewidth are shown in Figures 1 and 2, respectively. For more detailed information on the finesse, please see the Fabry-Perot Tutorial tab. Figure 1: An FSR Plot, Using a 1550 nm DFB Laser (PRO8000 Series). Using the model SA200-12B, 1.5 GHz interferometer, this plot is used to calibrate the time-base of the oscilloscope. Knowing that the FSR of the interferometer is 1.5 GHz, the calibration factor is found by setting 1.5 GHz = 3.2 ms between the two peaks. Figures 1 - 3 show example oscilloscope traces for the time scale calibration of our Fabry-Perot interferometers. For some of the more advanced oscilloscopes, as shown by the trace in Figure 3, linewidth and period analysis is automatic. These will typically display the information somewhere on the screen (in this case, it’s displayed at the bottom). For other scopes, the user may have to calibrate the time scale themselves. Figures 1 and 2 show this process for manual calibration using the SA200-12B 1.5 GHz interferometer (for many digital oscilloscopes, cursers can be used to mark the position of peaks on screen). Figure 1 shows the full FSR of the interferometer, with the two peaks separated by 1.5 GHz. By measuring the time between the peaks (3.2 ms in this example), the proper calibration can be calculated; 468.8 MHz/ms for our example. Once the time scale calibration is known, we can zoom in on one of the peaks to measure the FWHM in time (shown in Figure 2). The measured FWHM in this example is 10 µs (0.010 ms) and yields a linewidth of 4.7 MHz. From here the finesse of the system can be calculated along with any other necessary measurement. Here, δλ is the FSR or linewidth in space, δν is the FSR or linewidth in frequency, λ is the wavelength of the laser, and c is the speed of light. For example, in Figure 2 we have a FSR of 1.5 GHz for a 1550 nm laser. Converting to wavelength, we find that the FSR is 0.0121 nm. Likewise, the linewidth from Figure 3 is 5.1 MHz, which yields a linewidth of 0.000038 nm. Figure 2: This plot shows a close-up of the actual signal of the laser, which results from the convolution of the laser linewidth and finesse of the cavity; with the oscilloscope timebase calibrated from Figure 1, at 468.8 MHz/ms, we determine the FWHM for the interferometer to be 0.010 ms x 468.8 MHz/ms for a FWHM of 4.7 MHz. This provides a lower limit for the finesse of 320. Figure 3: This plot shows an FSR plot on a scope that automatically analyzes pulse width and period. The linear yellow line shows the voltage ramp, the blue line shows the FSR trace. The core of Thorlabs' scanning Fabry-Perot interferometers is an optical cavity formed by two, nearly identical, spherical mirrors separated by their common radius of curvature as shown in Figure 1. This configuration is known as a mode-degenerate, confocal cavity design, which is generally referred to as a confocal Fabry-Perot. The cavity is mode degenerate because the frequency of certain axial and transverse cavity modes are the same (degenerate). This degeneracy greatly simplifies the alignment of the instrument by eliminating the need to carefully mode match the input to the cavity. The confocal design offers several benefits over flat-plate interferometers such as easier alignment since the confocal interferometer is fairly insensitive to angular alignment. Additionally, the confocal design offers a unique property that at constant finesse as resolving power increases, so does the etendue (etendue is defined as the radiation from a source within a solid angle, Ω, subtended by an aperture with area A). By contrast, in a flat-plate interferometer as resolving power increases (at constant finesse) the etendue decreases; meaning that an increase in light intensity decreases resolution and vice-versa. Schematic drawing of mirrors of radius r separated by r to within a few microns. Ray trace of an off-axis input ray that traverses the cavity. In order to achieve a maximum in resonance from a Fabry-Perot cavity, the complete round-trip phase delay must be a multiple of 2π. For a plano-plano Fabry-Perot cavity with a round trip distance of 2r, this condition is satisfied when the frequency is mc/2r, were m is any integer, c is the speed of light in air, and r is the mirror separation. Therefore, the separation, or Free Spectral Range (FSR) between two transmission peaks is c/2r. For a confocal Fabry-Perot cavity, we must take into account that the modes of the cavity are Gaussian. By taking into account the phase shift of a Gaussian mode in the confocal cavity, it can be shown  that resonance frequencies of the transverse modes either overlap or fall exactly halfway between the longitudinal mode resonances. Therefore, the FSR for a confocal cavity the free spectral range is c/4nd. Because the actual optical path length of the confocal Fabry-Perot cavity is dependent on H, the resonance condition will vary across the input beam. This variation across the input aperture is a critical practical consideration when using a confocal Fabry-Perot Interferometer. As the input beam diameter increases, the second term in Eq. (2) becomes significant in comparison to λ. For a Fabry-Perot cavity, the finesse is a measure of the interferometer's ability to resolve closely spaced spectral features. The minimum resolvable frequency increment of an interferometer is based on the Rayleigh Criterion, which stipulates that for two closely spaced lines of equal intensity to be resolved, the sum of the two individual lines at the midway point can at most be equal to the intensity of one of the original lines (see Figure 3). as shown in the plot. 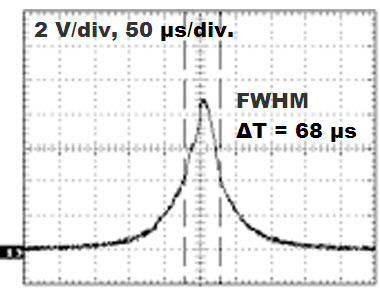 The total finesse of an interferometer is defined as the ratio of the FSR to the FWHM of the resonant peak, where Δ is the FWHM. As can be seen in Figure 3, two lines separated by Δ are just resolvable according to the Rayleigh criterion. Therefore, Δ quantifies the resolution of the system. Note that during the manufacturing of the interferometers, Ft is maximized in order to adjust the cavity length to the confocal condition by maximizing its value. This method provides a very precise means for setting the required length of the cavity to better than λ. The FSR and the FWHM of a representative lineshape are shown in Figures 4 and 5, respectively. An Ft of 294 is measured using a DFB laser with a linewidth that cannot be considered infinitely small in comparison to the resolution of the cavity. Therefore, the true Ft is about 320, assuming a 2 MHz laser linewidth. 1.5 GHz = 20 between the two peaks. This plot shows a close-up of the actual signal of the laser, which results from the convolution of the laser linewidth and finesse of the cavity; with the oscilloscope timebase calibrated from Figure 4, at 75 MHz/ms, we determine the FWHM for the interferometer to be 0.068 ms x 75 MHz/ms for a FWHM of 5.1 MHz. This provides a lower limit for the finesse of 294. Here, R is the mirror reflectivity. While the definition for the reflectivity finesse is ambiguous, Eq. (5) is presented as an effective finesse that is defined by Eq. (3) when the other contributing factors are negligible. For these interferometers, the reflectivity finesse dominates when operating with proper illumination . Using Eq. (5), the reflective coatings in the interferometers have been designed so that the minimum FR is better than 1.5 times the minimum specified finesse across their entire operating wavelength range for each model (see the table on the product page). This fixes the first term of Eq. (4). The second term in Eq. (4) involves Fq, which accounts for mirror irregularities that cause a symmetric broadening of the lineshape. The effect of these irregularities is a random position-dependent path length difference that blurs the lineshape. The manufacturing process that is used to produce the cavity mirrors ensures that the contribution from Fq is negligible in comparison to our specified total finesse for each model. The final term in Eq. (4), which deals with the illumination finesse Fi, will reduce the resolution as the beam diameter is increased or as the input beam is offset. When the finesse is limited by the Fi term, the measured lineshape will appear asymmetric. The asymmetry is due to the path length difference between an on-axis beam and an off-axis beam, resulting in different mirror spacings to satisfy the maximum transmission criteria. The approximate decrease in path length for a beam at a distance H off axis is given by the second term in Eq. (2). To quantify the effects of the variable path length on Fi, consider an ideal monochromatic input, a delta function in wavelength with unit amplitude, entering the Fabry-Perot cavity coaxial to the optic axis and having a beam radius a. The light entering the interferometer at H = +e, where e is infinitesimally small but not zero, will negligibly contribute to a deviation in the transmitted spectrum. Light entering the cavity at H = +a will cause a shift in the transmitted output spectrum, since the optical path length of the cavity will be less by an approximate distance of a4/4r3. Assuming the input beam has a uniform intensity distribution, the transmitted spectrum will appear uniform in intensity and broader due to the shifts in the optical path length. 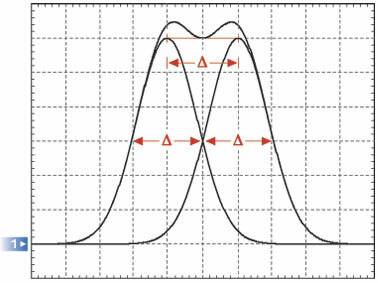 As a result, the wavelength input delta function will produce an output peak with a FWHM of H4/4r3. The λ/4 substitution for the FSR is understood by considering that the cavity expands by λ/4 to change from one longitudinal mode to the next. For an input beam with a real spectral distribution, the effect of the shift will be a continuous series of shifted lineshapes. It should be noted that the shift is always in one direction, leading to a broadened or assymmetric lineshape due to the over-sized or misaligned beam. This plot shows Ft(H) for the two different Fabry-Perot Interferometers sold by Thorlabs. The green curve is for the r = 7.5 mm cavity while the blue cure if for the r = 50 mm cavity. Eq. (8) is used to provide an estimate (albeit an overestimate) of effects of beam diameter effects on the total finesse of a Fabry-Perot Interferometer. Several assumptions lead to the overestimation of finesse. One is that the diameter of the beam is the same as the diameter of the mirror, in practice the diameter of the beam is typically significantly smaller than that of the mirror (this also helps to reduce spherical aberration) . Another assumption is that the light is focused down to an infinitesimally small waist size, even for monochromatic light the minimum waist size is limited by diffraction, and in multimode applications the waist size can be quite large at the focus. Figure 6 provides a plot of Eq. 8 for the two cavity designs offered (r = 50 mm and r = 7.5 mm). The traces in the plot were made with the assumption that the reflectivity finesse is equal to 300, which is the typical value obtained for mirrors used in our interferometers. In Equation (11), F is the finesse of the interferometer, λ is the wavelength, and d is the mirror spacing. For proper use of the interferometer the spectral resolving power and etendue need to be balanced such that enough light is allowed to enter the system without significantly reducing the resolution of the interferometer. The accepted compromise for this balance is to increase the mirror aperture until the the spectral resolving power is decreased by 70% (0.7*SR) . Under this condition the "ideal" etendue becomes π2λr/F, where r is the mirror's radius. Yariv, A., 1991, Optical Electronics 4th Edition, Holt, Rinehart & Winston, Philadelphia, 736 p.
 J. Johnson, "A High Resolution Scanning Confocal Interferometer," Applied Optics, vol. 7, no. 6, pp. 1061 - 1072, 1968. M. Hercher, "The Spherical Mirror Fabry-Perot Interferometer," Applied Optics, vol. 7, no. 5, pp. 951 - 966, 1968. Hi Vladimir, thank you for contacting Thorlabs. In principle, using an FPI as a spectral filter is possible. However, the Free Spectral Range of our high resolution Scanning Fabry-Perot Interferometers is as short as 10 GHz or 1.5 GHz depending on model (SA210 or SA200 series). In the wavelength plane, this corresponds to narrow wavelength bands 75pm or 11.25pm at 1500nm absolute wavelength. And filter bandwidth is as narrow as in the 7-70 MHz range (corresponding to 0.05-0.5pm). This means that the spectrum obtained by the Scanning Fabry-Perot will repeat itself periodically in either 75pm or 11.25pm wavelength bands and filter function is in the 0.05-0.5pm range due to the high resolving power of these instruments. So, filtering from these instruments would only be meaningful if your input signal is narrower than 75pm (or 11.25pm). Commercially available tunable Fabry-Perot filters typically have a Free Spectral Range in the 10 THz range (corresponding to ~100nm) and a bandwidth of a few hundred pm. Dear Support-Team Tank you for the information in the alignment guide. I have one question regarding the recommended beam size and lens for the FP interferometers you are mentioning in the table. The beam waist behind the lens is highly dependent on the beam waist in front of the lense. Which beam waist have you assumed to give these values? Thank you for your feedback. For example lenses with focal length 250 mm like LA1461-B or mounted version LA1461-B-ML will provide small enough waist well below recommended 600 µm for 2 mm diameter beam @ 812 nm on input. Can you also provide the high finesse FP cavities (SA30-52) at other wavelengths? Hello, thank you for contacting Thorlabs. We may be able to provide this, depending on your requirements. Please email us at techsupport@thorlabs.com to request a quote for custom items. Can SA201 or SA201-EC be used to drive PC4FL? Thank you for contacting Thorlabs. The SA201 is designed specifically for driving the piezos of our fabry perot devices. It is not intended to be a general purpose piezo driver. In order to drive the pc4fl actuator to it's full displacement you will need a driver that can supply 150 volts where as the SA201 provide 45 volts max output voltage at 15mA. I would recommend looking into the BPC301 or MDT694 piezo controllers which can provide a much higher operating voltage and current. HI, I have exactly the same question as geoffroy.aubry, about the piezo hysteresis. Not only that, but I also observe it on my setup. We use the FPI to measure the frequency spacing between two modes of our laser source. We calculate the spacing as: Dvu = FSR_FP*(DT_laser/DT_FP), where FSR_FP is the Fabry-Perot FSR (10 GHz nominaly), DT_FP the time spacing between two resonance peaks of the FP (i.e. one FSR in time), and DT_laser the time spacing between the 2 resonance peaks due to the two longitudinal modes of our laser. The problem is that DT_laser is not the same whether we are looking at the begining of the ramp or at the end, ie there is some dilatation. Could you contact me to help me calibrate this effect? Thank you. Hello, while the voltage is a linear triangle or sawtooth curve, the cavity length is changed by piezoelectric actuator which will have some hysteresis. This is most exaggerated at the edges of travel, particularly when the direction of travel changes. The response between voltage and position will be most linear in the center of the movement. Due to this PZT hysteresis, the conversion between frequency space and time space varies over the scan of the PZT elements. In order to get the best possible accuracy, we recommend calibrating the time axis in the vicinity of the mode to be measured. In other words, when evaluating the width of a particular transmission peak, calibrate the time axis with the two immediate neighbors of the mode under measurement. Could you please give detailed specifications of the mirrors used for the cavity? Are those mirrors separately available? What are the reflectances and transmissions for the back side and front side of the mirrors? Thank you for contacting Thorlabs. Yes, we can provide the mirrors of our fabry perot interferometers separately as a custom order item. Any custom or specials orders can be requested through techsupport@thorlabs.com. 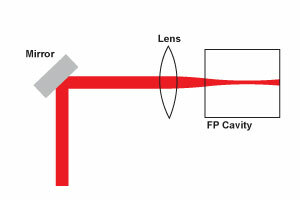 The reflectivity of the mirror coating material is above 99% for the coating design range however the typical transmission through the fabry perot interferometer is about 10-20%, the loss is do from absorption in the mirror substrate and coating material after multiple reflections through the cavity. In theory with no absorption loss present the transmission would be significantly higher. I will reach out to you directly with more information about ordering our fabry perot mirrors separately. Can the 7.5mm FP be used to obtain fringes with a white light source? Yes, it is possible to see fringes without using the drive electronics. You will have to open up the second iris all the way and remove the photodiode connected to the female SMA. The will allow the beam to leave the FPI housing and be projected on to your screen. In order to have good alignment, you will need to first set up your two alignment mirrors before the unit and make adjustments till you see fringes on the output. Once you see the fringes, adjust the z-position of your lens till you obtain optimal fringe contrast. In the 'Calibration' tab, in the example given, linewidth is found to be 4.7MHz, but the resolution for that paticular FPI is just 7.5MHz. If I'm not wrong, resolution is the least we can resolve any spectral line... then how can we measure a line of FWHM 4.7MHz using that particular FPI? We state that the SA 200 resolution is 7.5 MHz corresponding to Finesse = 200. The F=200 is a minimum spec, while the typical spec is F=250 corresponding to resolution = 6 MHz. The relation between finesse and resolution is defined F = FSR/FWHM, where F = Finesse, FSR = Free Spectral Range and FWHM = resolution. Our finesse spec is set quite conservatively, so it's not unusual that we ship units with finesse in the 300-350 range. In the example on the web, a F=320 cavity is used (a random unit tested from stock) corresponding to 4.7 MHz resolution. The 'd' (50mm) is given as 'nominal distance'. So is this 'd' exactly the minimum distance between the two mirrors or the maximum? I mean when we apply voltage, does the distance between the mirrors increase from 50mm or does it decrease to an even lower value than 50mm? Or is it the average? If so, then what is the minimum and maximum 'd' achievable by applying voltage? And also could you please specify the sensitivity of the piezo, as in what is its V/mm rating? Hello, thank you for contacting Thorlabs. 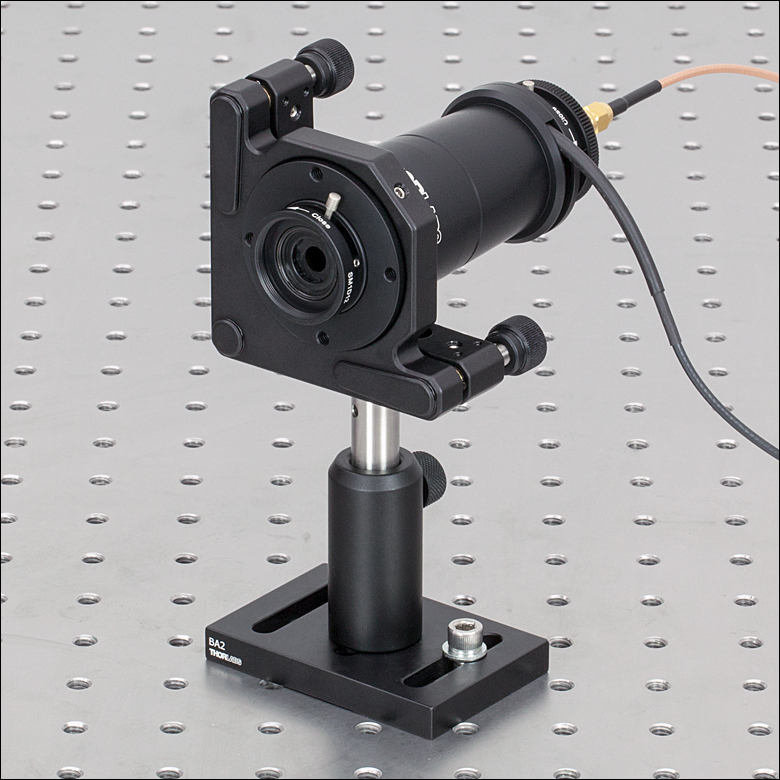 The nominal mirror separation d is 50mm with a ±0.1mm tolerance. The piezos used in the SA200 series have a displacement of 9µm for 150V. 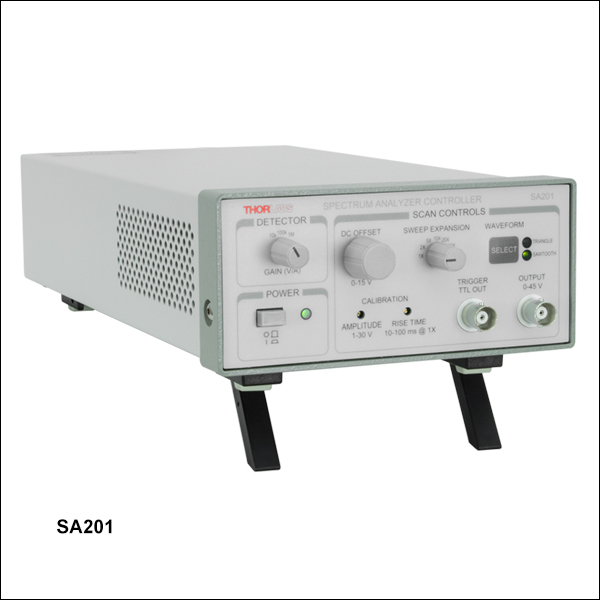 The SA201 Control box has a max voltage swing of 30V, so the maximum displacement is typically 1.8µm and, in most cases, the full 30V swing is not really necessary. Thus, the distance variation due to applied piezo voltage is typically on the ~1µm scale. Is it possible to get just fringes with this instrument without scanning and all? I mean if I just want to display the fringe pattern on a screen for some purpose apart from scanning? What alignment precautions will have to be taken in that case, since we won't be using the controller and scope for alignment? Hello, I am wondering if your products are suitable for use in a vacuum. My company is interested in developing a space based system using an interferometer. Are your FPIs air spaced? I would assume they might just pop in a vacuum if they don't have a way to outgas. Response from Yashasvi at Thorlabs USA: Hello, thank you for contacting Thorlabs. The stock FPI's you see on our website are not suitable for vacuum use. What is the pressure/vacuum level you intend to use this at? The mirrors used in these are air-spaced, however. We could look into offering just the stripped invar cavity module without the outer housing. We would also have to use vacuum grease and vacuum compatible glue. I have reached out to you directly to discuss this further. Hi guys, Can i use a sawtooth voltage from an external function generator to drive the piezo of the FPI? I´m planning a servo-loop feedback to lock a laser to a peak of the FPI, but i need to close the scan. So, can i feed the piezo with a near DC cero voltage from this external generator? Thank you for contacting Thorlabs. Yes you can use an external function generator to drive the piezo actuators in these fabry perot interferometers. As long as your operating voltage is within our specified range of 0-150V this will be fine. Hi, If there is a refractive index variation in a material that is probed by a FPI, the phase delay would shift and the transmitted intensity would thus vary. What would be the required sensitivity to measure a varying intensity under very small refractive index modulation? Would your products be able to detect a RI variation of 10^-6 or 10^-5 ? Hello, thank you for contacting Thorlabs. 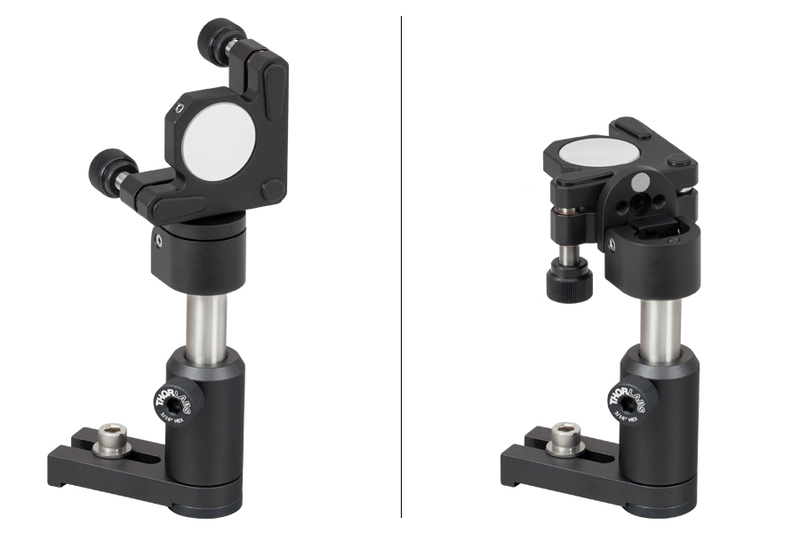 These FPIs are not for measuring absolute or relative changes in refractive index. They could however measure sidebands if that refractive index change is periodic and if it fast enough that the sideband spacing is greater than the resolution of the FPI and if the depth of modulation (change of index times the path length) is great enough to transfer significant power into the sidebands. I will reach out to you directly to discuss this application. Thank you for contacting Thorlabs. We can provide custom coatings for our scanning fabry perots for this wavelength range. I will contact you directly to discuss our custom capabilities. Hello, thank you for contacting Thorlabs. The cavity length is controlled by piezo-electric actuators which have some hysteresis. This leads to small non-linearity between voltage and position, particularly at the edges of travel where the direction switches. I will reach out to you directly to discuss this effect. I am working on 2um. For SA200-18C and SA210-18C, which fiber collimator is suitable? Besides, among the two interferometer models (1.5 GHz and 10 GHz), which FSR is more suitable for optimizing the mode hopping of TLK-L1950R? Hello, thank you for contacting Thorlabs. I am unsure whether you are looking at the 10dB tuning range of the TLK (about 9THz) or the linewidth of a single mode (about 100kHz). In the case of the whole range, the bandwidth would be much larger than the free spectral range of SA200-18C or SA210-18C. In the second case, the linewidth would be smaller than the resolution of SA200-18C or SA210-18C, so you wouldn't be able to look at structure. I will reach out to you to clarify your application, but I'm not sure either of these interferometers would be suitable for your application. For the collimation, a reflective collimator would be convenient for avoiding chromatic focal shift. Hi, Could this product be fit with free-space to SM-fibre-couplers on both the front and back faces of the cavity? Thanks. Hello, thank you for contacting Thorlabs. While we do not currently offer a fiber pigtailed version, I will post this in our internal engineering forum. I will reach out to you directly to discuss your application. Could you please tell me the transmittance percentage of 1064nm laser light (or similar) through the back side of the input mirror? For Model SA200-8B. Hello, thank you for contacting Thorlabs. The peak transmission will be about 10-20%. After many passes through the cavity, the normally negligible absorptivity of the mirror coatings becomes relevant. I will reach out to you directly about calculating this. 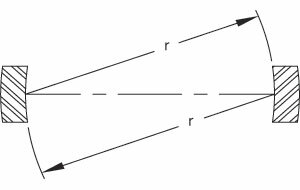 1) In the tutorial you claim there are no lensing effects due to equal curvature of the inner and outer surfaces of the cavity mirrors while we have measured a diverging lensing effect of the cavity (though not very strong). Can you confirm this? 2) Why is the transmissivity at resonance so low (10-20% instead of a theoretical 50% given the AR coatings) for this device? Is there a way to improve it? Thanks a lot. Hello, thank you for contacting Thorlabs. Because light light is typically focused into the cavity, I'd expect it to diverge out the opposite end into the detecting photodiode. I have contacted you directly to discuss the lensing you mentioned. As for the transmission, it will depend primarily on the reflectivity and absorptivity. Though the absorptivity would normally be considered negligible, in a Fabry-Perot cavity, the light may reflect many times off of each surface, and the small components of absorption because relevant. In general, out Fabry-Perot Interferometers would be expected to have a maximum transmission of about 10-20%. I've also contacted you to discuss this. Do your company sell a pair confocal mirrors of SA200-5B, respectively? Thank you for contacting Thorlabs. We can provide the mirror components. A Tech Support representative will contact you directly about information for this quote. When the voltage to the piezoelectric is increased, does this increase or decrease the length of the cavity? The diagrams suggest an increase, but I would like to know for sure. I need to know this as I would like to know which direction corresponds to increasing optical frequency, to distinguish +ve and -ve sidebands applied to a laser. Response from Jeremy at Thorlabs: The cavity length is increased with increase voltage. I suggest considering a "FPI for Dummies" tab. We are trying to decide if we need a Fabry-Perot interferometer. We are using a good spectrometer, but need more resolution. I knew nothing about FPI before coming to your site. After several times through your pages, I still am asking myself, "how does all this work, and will it give us the resolution we need." Leo in your Engineering dept has been helping, so thanks to him. I am a physicist, educator, and writer, so I know the difficulties of conveying complex ideas to someone who does not already know the subject. But I find your web pages are talking to someone who already knows the subject. Response from Tim at Thorlabs: thank you very much for your feedback. We will look into improving our tutorial on Fabry-Perot interferometry in the near future. Please continue to contact Tech Support with any questions you may have. I'm looking for something like the SA-200-3B Fabry-Perot, but I need it to work at 323 nm. Is it possible to get a custom coating? Hello, thank you for contacting Thorlabs. I will reach out to you directly about the availability of custom coatings. Would it be possible to purchase the two concave mirrors (center wavelength 532nm) and what would be their reflectivity? Also do you have a range of curvatures or is it just 50mm? Hello. Thank you for contacting Thorlabs. I have reached out to you directly with information on our stock concave mirrors as well as information on how the coatings differ. Whether these will be suitable or whether you need the mirrors from our FPIs will depend on the application. do the mirrors used in thorlab fpi are wedged mirror? could you pls provide the links for the dielectric coated mirrors that could use in fpi for laser wavelength 660nm? Response from Jeremy at Thorlabs: The mirrors used in the FPI are two concave mirrors. We do not have these as stock items on the web but we can provide them separately. I will contact you directly about this. Hi, I am looking for a solid etalon. I could only find the Fabry-Perot interferometer on Thorlabs but not a solid etalon. By a solid etalon, I mean a parallel glass with coatings on both sides. Here is my requirement: I have an optical beam (632nm or 66nm) which I want to split into multiple parallel beams. These are normally created by internal reflection and transmission. I'd really appreciate it if you can help me locate this on ThorLabs catalog - I searched a lot but could not find one. Many thanks, Vijay. Response from Bweh at Thorlabs USA: Thanks for contacting Thorlabs. We don't offer such solid etalons at this time. We will however look into this based on your feedback. I will contact you with recommendations on where to get these. and whats the transmission of this interferometer itself? Response from Bweh at Thorlabs USA: The transmission at resonance will be in the 10-20% range. This will vary between individual units and different coating runs. Outside resonance, transmission will be in the 10^-4 range through the cavity due to the extremely high mirror reflectivity of >99%. Could you let me know whats the radius of curvature of the mirror? is it same with cavity length? Response from Bweh at Thorlabs USA: Due to the confocal cavity, yes it will be equivalent to the cavity length. 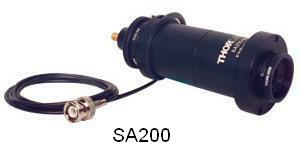 Response from Jeremy at Thorlabs: The SA200-12B includes the SM05PD4B photodiode. Hey guys, My question is about the finesse of the SA200-8B FPI. In the .XLS of the reflectance and Finesse you have values above 200, and you say that the values may vary slightly, but i got values beneath 200 in wavelengths between 790-900. The equation for the finesse is F=FSR/FWHM, and i'd measured the distance of adjacent transmission peaks to be the FSR and with mathematica computed the FWHM=gamma with a lorentzian function. Still i got very low values, What am i doing wrong? its laser power dependent? or the alignment its wrong? Hope to hear from you soon, thanks. Response from Jeremy at Thorlabs: This is sensitive to your input alignment and beam size. I will contact you directly to troubleshoot about your application. You can also contact us at techsupport@thorlabs.com in the future about similar requests. Is the internal Invar cavity hermetically sealed? Response from Jeremy at Thorlabs: The Invar cavity is not hermetically sealed. Hi, I was wondering if fibers can be adapted, somehow, on both sides of the interferometer to include it in a larger set-up. That would be useful for us to have this possibility. Thanks in advance. Response from Jeremy at Thorlabs: We will contact you directly about customizing this. Response from Jeremy at Thorlabs: You would generally want all the modes to be captured within 1 FSR. For regular HeNe, the 10GHz FSR version would be better. Typical Fabry-Perot LD would have modes much wider than 10GHz so this will probably not work well. I will contact you directly to discuss more about this. Hello, can you offer us a version of this for 4400-4600nm range or sell a version without mirrors/detector? Thank you. Response from Jeremy at Thorlabs: We will contact you directly about this special. Hello ,I want a Fabry-Perot with 300~600GHz FSR. Do you have this product?? Please contact me as soon as possible. Response from Jeremy at Thorlabs: We do not have a version with such a large FSR at the moment. Do you also offer custom made versions that are usable in the range of 0.3 to 4 THz? Response from Jeremy at Thorlabs: We do not currently have this for THz application. I will contact you directly to provide more details. Response from Bweh E at Thorlabs: The SA200-8B Scanning Fabry Perot Interferometer has a free spectral range FSR of 1.5GHz, i.e the spectrum will repeat itself with 1.5 GHz mode spacing. Remember that 1.5GHz optical frequency shift at 780nm (for example) corresponds to only about 3pm wavelength shift. Given that the wavelengths of the two laser sources are separated by less than 1.5 GHz (or 3 pm at about 780nm) they can be compared and you are able to determine the frequency difference between them very accurately. If the frequency spacing between the two lasers is larger than 1.5GHz, then you are not really able to tell what the total frequency spacing is other than measured value ( distance between peaks) plus or minus an integer number of FSR’s. So, to be able to tune the unknown laser frequency to the known one, you would first have to know that the frequency separation between the two is less than 1.5GHz to be able to make a useful measurement using the SA200-8B. I hope you can help me guys, i have two lasers impacting on the FP. I know the wavelength of one of them, but i need a reliable way of obtaining the wavelength of the other one. Can you tell me how can i get that wavelength? I know the FSR of my FP(SA200-8B), and the linewidth of the lineshape in frequency, but i can't come up with a way of obtaining lambda. Response from Jeremy at Thorlabs: The output voltage range is 1-45V. The scan voltage is adjustable from 1-30V and you can put in an offset voltage of 0-15V. Can this FP cavity reconstruct for those: 1. replace the mirror with our own mirror. 2. insert one piece of glass in between the cavity. 3. control with our exist function generator. Response from Jeremy at Thorlabs: The components of the cavity are epoxied in place and we do not recommend replacing this yourself. We will get in touch with you directly to discuss about your application. I have n SAPlus Burleigh confocal spectrum analyzer for the 1500nm spectral range. Can you provide replacement mirrors for the 808nm region? Response from Jeremy at Thorlabs: We will contact you directly regarding the mirrors. Can you specify what you mean with "Ultra-Stable Athermal Invar Cavity"? How large ist the drift in Mhz/K? Using an external heater with SA200-14A, we measured a temperature coefficient of frequency of approximately -0.097 GHz/K around 297K. Using an external heater with SA210-14A, we measured a temperature coefficient of frequency of approximately +1.56 GHz/K around 297K. The measurement was made using an older model, but the drift values should be comparable as the mirror dimensions and substrate are identical. The values should also be comparable within the respective SA200 and SA210 families with different mirror coatings. I will contact you directly. I have a SA210-8B that has damaged coatings. I calculate the peak on-axis irradiance inside the cavity, with enhancement from finesse, to be about 17W/cm^2 CW at 1053 nm. That is the highest power this etalon has ever been exposed to. Whatever the damage threshold is for these coatings, it's pretty low. I purchased a replacement SA210-8B and will greatly reduce the input power, however it will probably be insufficient for my application. So here's my question: If I return the etalon with the damaged coatings, can I have replacement mirrors installed that have higher damage threshold V-coatings at 1053 nm, or with V-coatings centered at 1064 nm, if that is more convenient? If yes, can you provide a quote for cost and lead time? Thanks, Darrell Armstrong. Response from Tim at Thorlabs to Darrell: Thank you for your feedback. We will contact you to go over your beam parameters and to discuss a quote. Does the controller provide FP with a DC output instead of sawtooth/triangle? Response from Jeremy at Thorlabs: The SA201 only provide sawtooth or triangle waveform and no pure DC output. There's however an adjustable DC offset feature. Response from Jeremy at Thorlabs: We are currently revising the FP interferometer tutorial online and we will make it available on the website shortly. I will get in contact with you directly regarding some references to the working principle of this device. We purchased two Scanning Fabry-Perot interferometer and we are using in our laboratory. We want to know the working principles of this instrument but it is not available from the thorlab website. So can you send some papers or tutorial about the SFB interferometer. Response from Ryan at Thorlabs: Thank you for contacting us. A confocal cavity, such as is used here, works best with a TEM00 (Gaussian, spatially coherent) beam, as light is continually focused at the center by the cavity mirrors. My feeling is that it wouldn’t be suitable for your application if the emitter is larger than a couple tens of microns because rays will traverse different paths (and path lengths) through the cavity. This would result in multiple lines apparent on the scope or lower resolution. We are not aware of an appropriate solution for collimating light that does not emanate from a point source. Using a small pinhole and aspheric lens may be effective to some extent, but the power will be quite limited. The minimum power required depends on the quality of the beam, spectral distribution, wavelength, amplification of the detector and the skill of the user. Using the included detector and recommended setup at 800nm, ~50uW may be used as a guideline for the lower bound of a practical value of TEM00 light that can be detected. However, it cannot be said for certain in the case of this application. Can SA210-5B be used to detecte the radiation from an ordinary rubidium hollow-cathode lamp?And how can I collimate the light into the interferometer?What is the minmum allowed input power for the SA210-5B ? Response from Sean at Thorlabs: Thank you for your feedback. We have been investigating the text issues on this page. There appears to be several formatting issues on the tutorial tab which are causing some text to display unusually in several browsers, and we will fix that problem today. We will also revisit the text on this page within the next several weeks to improve it. I am contacting you directly to see if you have any specific recommendations. You should proofread the overview section of the fabry-perot description. There are some missing words that make it hard to read. Response from Jeremy at Thorlabs: The photodiode used in the SA200-18B is the FGA20. You can see the specs you are looking for in the spec sheet found at http://www.thorlabs.com/Thorcat/12100/FGA20-SpecSheet.PDF. Do you have the specification for the photodiode that comes with SA200-8B? More specifically, I want to know the photo sensitivity, effective area, dark current, cutoff frequency and capacitance. Thanks. Response from Buki at Thorlabs to littlefox121: Thank you for participating in our feedback forum. The scanning Fabry Perot is designed for CW light sources. I have contacted you to provide further assistance. Response from Javier at Thorlabs to ghiyas1111: Thank you very much for contacting us. All of the documentation concerning the operation and setup instructions for our scanning Fabry-Perot interferometers is available on this page. I would suggest starting with the online tutorial so that you can familiarize with the theoretical background of these devices. You can find it in the Overview tab and here: http://www.thorlabs.com/tutorials.cfm?tabid=21118. Now, for optomechanical alignment instructions of the interferometer, you can refer to the manual. This document is available on the Documents and Drawings tab and also here: http://www.thorlabs.com/Thorcat/19500/19501-D02.pdf. I will also contact you directly for further support. Response from Javier at Thorlabs to Lars Sandström: we do not have test data for the damage threshold of these Fabry-Perot interferemometers. However, the limiting factor is the power handling capability of the detector. As a guideline, it is recommended to limit the input to below 100 mW/cm^2. What is the maximum allowed input power for the SA210-5B to avoid dammage to the device? A response from Adam at Thorlabs to jdonnelly: We recommend using as much force as possible. It is possible for these to get stuck and become impossible to remove. If that is the case, we can take it back for repair. It is not clear to me how to remove the detector unit, as specified in your alignment directions. The threaded piece at the back looks like it should turn but it doesnt, at least by hand. We are reluctant to use more force unless you so recommend. A response from Tyler at Thorlabs: In addition to a plot of the mirrors reflectance, an Excel file has been added to the Graphs tab that contains the data used to make the plot. A response from Tyler at Thorlabs: Thank you for suggesting the need to have the mirror performance data on this webpage. I added the Graphs tab to the presentation with this data on it. Please let us know if you need any additional information. A response from Ken at Thorlabs: We can send you the coating curves if you can provide your email address. A response from Greg at Thorlabs to dergachev: Thank you for your interest in our SA200 series of Fabry-Perot Interferometers. We should be able to make a custom SA200 that fits your needs. A member of our Technical Support team has e-mailed you to discuss this possibility. A response from Tyler to melsscal:For the SA200-14A, which has a wavelength range from 1450 nm to 1625 nm, the following parts are required to replicate the setup shown in the Alignment Guide tab. PH4E (Qty. 2), TR4 (Qty. 2), ER6 (Qty. 8), ER4 (Qty. 8), LCP02 (Qty. 1), CP02 (Qty. 1), SM1V10 (Qty. 1), AC254-250-C (Qty. 1), SM1L03 (Qty. 1), KCB1 (Qty. 1), BB1-E04 (Qty. 1), CP02FP (Qty. 1), and PAF-X-18-PC-C (Qty. 1). The optional alignment guides, which I strongly recommend, are the LCPA1 and CPA1 (1 Each). There are definitely other ways to do this so I recommend talking to a member of our tech support department. I will email you this list, which can then be turned into a quote if you desire. Thank you for using this feedback forum to post your question, as I think that this information may be useful to other customers. Can you please confirm the parts list for the fiber coupled setup with SA200-14A. Response from Tyler at Thorlabs to melsscal: Thank you for your interest in our product. The output connector on the photodiode in the Fabry-Perot Interferometer is SMA. 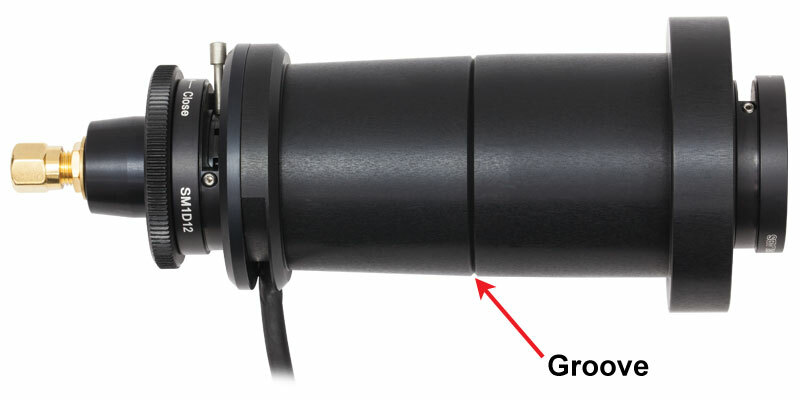 Included with the interferometer is a cable with an SMA connector on one end and a BNC connector on the other end. This information will soon be part of our product presentation. Thank you once again for taking the time to help us make our product presentation better. How we will get the output of this etalon? Consider adding the following: If launching a free space beam into the interferometer, the beam size should be approximately 4mm. For optimum performance, the beam should then be focused to a waist with less than 600um diameter using a lens with approximately 250mm focal length. The center of the Fabry-Perot cavity should be located near the beam waist. To achieve this, use an FC/PC collimator (Thorlabs item# F260FC-*, page 1010 Thorlabs catalog, Vol 19) to collimate the beam from your fiber coupled laser. Then a lens with 250mm focal length should be inserted into the collimated beam to produce the desired spot size. We recommend the Thorlabs item# LB1056-C found on page 708 in the Thorlabs catalog, Vol 19. 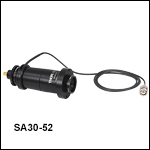 The SA30-52 is a high finesse version of our 1.5 GHz FSR Fabry-Perot interferometers. The resolution of this interferometer is 1.0 MHz. The mirrors are designed for use in the 488 - 545 nm range (see the Graphs tab above). The SA200 series of Fabry-Perot interferometers have a free spectral range of 1.5 GHz. With a minimum finesse of 200, the resolution of these interferometers is 7.5 MHz. Seven optical coatings are available with operating ranges from 290 to 4400 nm, including one dual-wavelength coating (SA200-2B). For details on these wavelength ranges, see the Graphs tab above. For the SA200-18C, the included photodiode detector is sensitive to wavelengths from 1.8 - 2.6 µm. Since the reflectance of the mirrors inside this device remains over 99.0% in the 2.6 - 2.8 µm range, an alternative detector can be installed to use the instrument over an extended wavelength range. For this purpose, we recommend Thorlabs' PDA10PT (PDA10PT-EC) detector, which can be attached to the Fabry-Perot interferometer using an SM1T2 lens tube coupler. The SA200-30C has a coating designed for 3.0 - 4.4 µm and does not include a detector. We recommend using the PDAVJ5 HgCdTe Amplified Photodetector, which is sensitive to wavelengths in the 2.7 - 5.0 µm range. 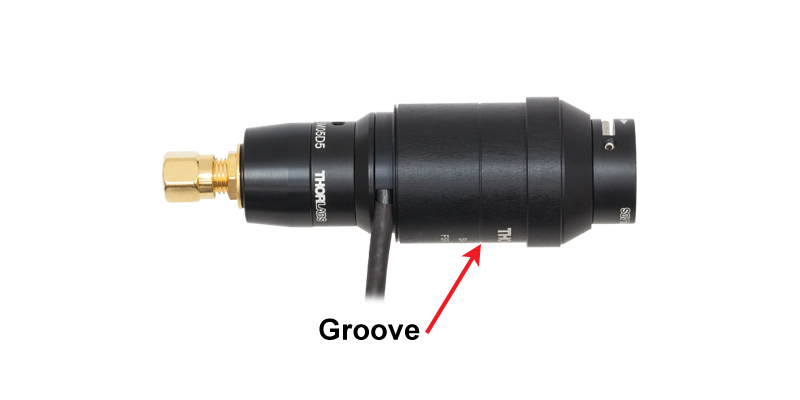 The PDAVJ5 and the SA200-30C, which have external and internal SM1-threading respectively, can be directly mounted together without using additional threaded adapters. 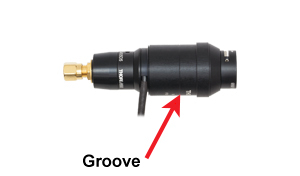 Please note that the PDAVJ5 includes a transimpedance amplifier, so the detector should not be connected to the transimpedance amplifier of the SA201 controller when operating the interferometer. Additionally, due to saturation effects of the diode inside the PDAVJ5 detector, the optical power entering the SA200-30C should be kept below 200 µW in order to avoid saturation. 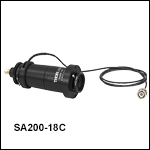 The SA210 series of Fabry-Perot interferometers have a free spectral range of 10 GHz. With a minimum finesse of 150, the resolution of these interferometers is 67 MHz. Five wavelength ranges are available from 350 nm to 2600 nm. For details on these wavelength ranges, see the Graphs tab above. For the SA210-18C, the included photodiode detector is sensitive to wavelengths from 1.8 - 2.6 µm. Since the reflectance of the mirrors inside this device remains over 99.0% in the 2.6 - 2.8 µm range, an alternative detector can be installed to use the instrument over an extended wavelength range. 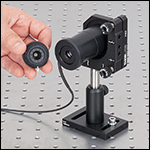 For this purpose, we recommend Thorlabs' PDA10PT (PDA10PT-EC) detector, which can be attached to the Fabry-Perot interferometer using an SM1T2 lens tube coupler. 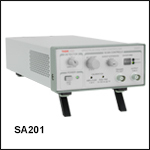 The SA201 is specifically designed to control Thorlabs' Fabry-Perot interferometers by generating a highly stable, low-noise voltage ramp. This ramp signal is used to scan the separation between the two cavity mirrors. The controller, which features a power supply with a 100, 115, or 230 VAC switch-selectable input, provides adjustment of the ramp voltage and scan time, allowing the user to choose the scan range and speed, while an offset control is provided to allow the spectrum displayed on the oscilloscope to be shifted right or left. The output trigger allows the user to externally trigger an oscilloscope on either the beginning or midpoint of the ramp waveform. The ability to trigger the oscilloscope from the midpoint makes zooming in on a line shape more convenient; just place the spectral component of interest on the center of the screen and increase the timebase of the scope. There is no need to use the offset to re-center the signal; the scope expands about the point of interest. A calibrated zoom capability provides a 1X, 2X, 5X, 10X, 20X, 50X, or 100X increase in the length of the ramp signal, thus allowing an extremely wide range of scan times. The SA201 also includes a high precision photodetector amplifier circuit used to monitor the transmission of the cavity. The amplifier provides an adjustable transimpedance gain of 10 kV/A, 100 kV/A, or 1000 kV/A when driving a high impedance load, such as an oscilloscope. Using the output sync signal from the controller, an oscilloscope can be used to display the spectrum of the input laser. The detector circuitry incorporates a blanking circuit, which disables the photodiode response during the falling edge of the sawtooth waveform. The SA201 is shipped with a 120 VAC power supply line cord for use in the US, while the SA201-EC is shipped with a 230 VAC power supply line cord for use in Europe.